This is my final posting of the band. I submitted this photo for Bay Area Photo Club’s March assignment of blur. The blur is totally achieved in the camera. In fact the only things done in Photoshop was sharpening all the eyes and converting the photo to black and white. The blur was caused by the band swaying back and forth while using a slow shutter speed and two Elinchrom strobes that were fired in rear-synch mode. Camera settings: Nikon D3 on a tripod, Nikon 24-70mm f/2.8 shot at 70mm, ISO 100, f/19, 1/6th of a second with two Elinchrom strobes with a silver umbrellas. 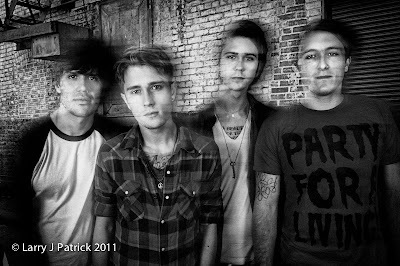 Photoshop CS5—sharpened the eyes of all the band members and used nik Silver Efex Pro to convert photo to black and white. Love the blur. Seems fitting for the subject. Wonderful effect even if I do not understand how you did it. FAB-U-LOUS! I love this shot, everything about it, best band shot ever, IMHO. Joe ain't got nuthin' on you :). Definitely my favorite shot of what you have presented to date. Exposure and B&W treatment fits the mood, background sets them off and the movement is the final touch. A cover shot for sure. You da' man. Love the shot. How did you get the idea to do this? I have never seen a photo like this one. I like it. This is a photo that you immediately think "photoshop" but then you look closer at it and think how did they do it in photoshop. Thanks for the explanation. You created something unique that I will try to copy. I love this photo. It just draws you into it. Out of the box thinking on this one. Grabs your attention. Would like you to do more creative things like this. I bet the band is thrilled with this one. Very different. A photo that holds your attention. I like the effect but not sure it is a portrait that can be used.